As a severe storm front rapidly closes in on the UK, all flights out of East Midlands airport are cancelled – all save Atlantic Sky Airways Flight 686, bound for New York. Shortly after take-off, several passengers become concerned when one of their number inexplicably goes missing. Their anxieties are further increased when it becomes apparent that the flight has veered off course and it is revealed that the plane is carrying an interesting item of cargo: a rare and extremely valuable ancient Chinese vase. The assumption is that terrorists are responsible, but nobody on board is showing their hand – for now. With tensions rising amongst the passengers and crew, violence soon breaks out, forcing those behind the deadly plot to expose their identities. Meanwhile, on the ground, concerned aviation chiefs and the military have together authorised the launch of fighter jets to deal with what they believe could be a deadly hijack situation. But hijacking is soon proved to be the least of anybody's worries when the owner of the vase recounts a myth surrounding its ancient origins. Directed by actor-producer-director Dominic Burns (How to Stop Being a Loser), Airborne is the fiurst feature for some time and the first British feature ever to star Mark Hamill, who must be thoroughly fed by now with being reminded that he once played Luke Skywalker, particularly as he's better known now as the voice of The Joker in the Batman: Arkham Asylum game and it's spiffy sequel. Bringing up support is Craig Conway, Billy Murray, Sebastian Street, Simon Phillips, Julian Glover and – hey! – Dominic Burns. 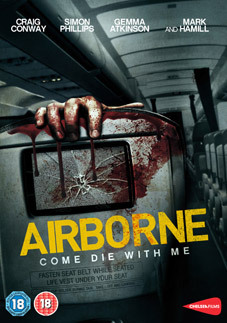 Aiborne arrives on UK DVD on 23rd July 2012 from Chelsea Films at the RRP of £12.99.